(L-R) Point Park University students Nikole Kost, Josh Croup, Nicole Pampena and Gracey Evans in Washington, D.C.
Students and faculty from the School of Communication and Honors Program got an inside look at media and history during the annual fall semester trip to Washington, D.C.
"The energy of Washington, D.C. is completely different from Pittsburgh," said Parker Werns, a graduate intern for the Honors Program. "Pittsburgh has a blue-collar, Rust Belt feel to it, something that is part of its charm. D.C. has none of that; it feels powerful and put together." The three-day trip began with a visit to the Newseum, which opened in 2008 and seeks to promote, explain and defend the five freedoms of the First Amendment. Josh Croup, a junior broadcasting major and an honors student, said this was his favorite part of the trip. "It's been a bucket list item for me for years now, and to experience it with other members of The Globe staff who were also on the trip was just icing on the cake. I could have stayed there for days," he said. Students also had the opportunity to attend a presentation of a new documentary, Where Love is Illegal, as part of FotoWeekDC 2016 at the National Geographic Museum, or check out other FotoWeekDC events independently. FotoWeekDC began in 2008 as a way for students and professionals alike to view high-quality photography and make it more easily accessible. "The presentation was very striking. The photos, taken of LGBTQ citizens in areas where their identity is illegal, were brave and powerful," Werns said. "The photographer was well spoken and gave good background to both the individuals in the pictures and the larger society they lived in." The following day, students were able to share a meal and network with Point Park alumni working in D.C.
"The economy and focus [of D.C.] is completely different, which as a Pittsburgher, gives D.C. an exciting vibe," said graduate student Ashley Murray. 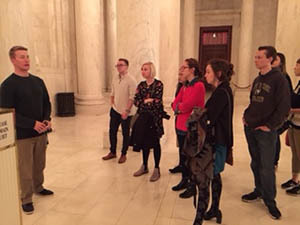 After the brunch, students were given a private tour of the Supreme Court of the United States by Honors Program alumnus Thaddeus Covaleski, an intelligence and national security major. "I loved the behind-the-scenes tour of the Supreme Court. We not only toured the actual court room, but we also saw the Supreme Court law library and gymnasium," Murray said. "Our tour guide, a Point Park honors alum who studied national security, is now a police officer at the Supreme Court. He really took time out of his weekend to show us around." A trip to the United States Holocaust Memorial Museum was next on the agenda. "The Holocaust Museum is incredibly sobering," Werns said. "They show how the rise of Nazi Germany happened primarily through complacence, lack of action and fear." The museum is a living memorial to the atrocities of the Holocaust as well as an educational center. Dedicated in 1993, the museum seeks to prevent future genocides as well as foster remembrance of the Holocaust. "There's a certain historic vibe that exists in Washington that Pittsburgh doesn't have," added Croup. "Both are historic cities, but everywhere you go in D.C. is historic. It's everything you've ever read about in the history books right in front of you. It's a fascinating city."